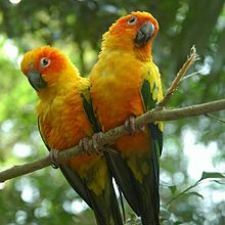 Native to Central and South America, Conures are small/medium sized parrots. They are fun-loving birds with a great sense of humor. Most species are known for cuddling and enjoy learning new tricks. Conure’s personalities can best be described as curious, inquisitive, and playful. They have a sweet disposition and love attention and closeness with their caretakers. They are not afraid to hold their own with other parrots, even larger ones. Usually they enjoy learning new tricks and can be very entertaining such as learning how to dance. They can even be taught to go “potty” with a simple command. Most will talk but they do not have the vocal skills of African Grey or Parakeets. However, they will be heard and are known for the occasional screeching. Generally they love to snuggle under things, so providing them with a tightly woven wash cloth, soft piece of fabric, or fuzzy toy will be appreciated. A bird tent as a place to sleep and hand out is usually eagerly accepted and treasured. As they like to climb under pillows and blankets, care needs to be taken not to accidentally smother them. Probably the most important thing to consider when shopping for a Conure bird cage is interior space. Most experts recommend getting as large a bird cage as you can afford, but it is also very important to consider the bar spacing. As a rule of thumb, your parrots should have sufficient room to freely spread both wings. Nearly all of our medium and large sized stand-up cage will work for Concures. 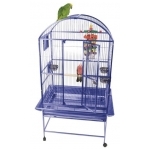 At a minimum, consider a minimum sized bird cage that is 24” wide, 24” deep, and 24” tall. Also watch for bar spacing. Typical bar spacing ranges are 5/8 inch to 3/4 inch wide. Generally they love to snuggle under things, so providing them with a tightly woven wash cloth, soft piece of fabric, or fuzzy toy is a plus. A bird tent provides them a secure place to sleep. All parrots are creative and will find ways to open doors and get out of their cage. Look for entry doors and feeder doors that have locking mechanisms to prevent an accidental escape. Slide out trays and grids are easier to clean than solid cage floors. Some cages come equipped with seed guards around the base of the cage which helps keep the mess inside of the cage. Play top cages provides a great place for parrots to hang out. - Conures benefit from a medium sized or larger bird cage, consider a minimum of 24" wide, 24" deep, and 24" tall. - They like to socialize with their owner so consider a high visibility area of your home.